By now you all know I have a thing for veggie burgers (exhibit a, b and c). Well, it’s time for you to meet my newest creation. It’s Southwest-inspired, super hearty, quick and seriously satisfying. 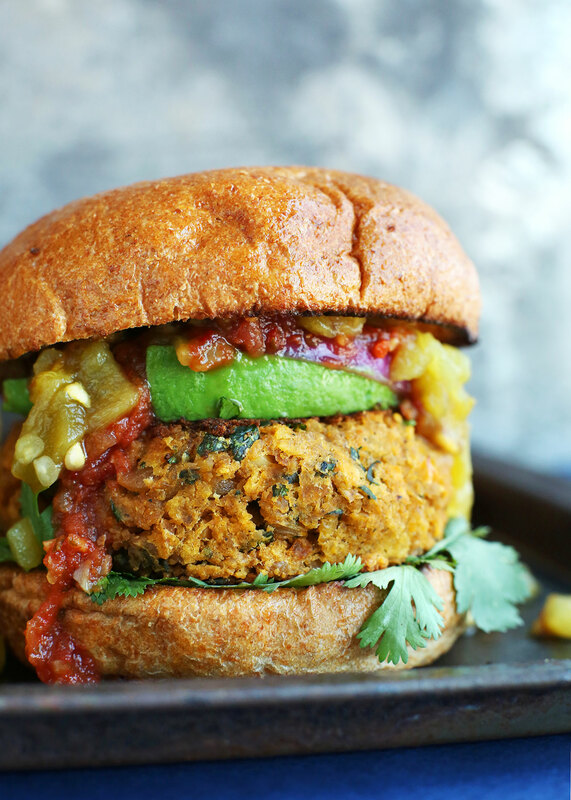 This recipe is inspired by my love for Mexican food and all the veggie burgers. If you’ve never experimented with green chilies before, you must! They’re super flavorful and available in both mild and hot so you to control the heat. Plus, you don’t have to do anything besides crack the can and pour them in. Hello simple. Speaking of simple, this recipe requires just 1 bowl, 30 minutes, and about 10 ingredients (give or take a spice). Hello simple, indeed. The beauty of this recipe is it’s super versatile when it comes to cooking method. The burgers can be simply sautéed and served as is for a more tender texture, or popped into the oven and baked for another 20 to 30 minutes to firm up even more. This allows you to control the tenderness and reach the ultimate texture you desire. In my opinion, these get taken to the next level with toppings (although totally optional)! I went with cilantro, red onion, salsa, extra green chilies and a whole wheat bun. But to keep these gluten free you could also wrap them in lettuce or enjoy atop a Mexican salad! If you give these burgers a try, let us know what you think! Leave a comment and rate it – it’s super helpful to us and other readers. And don’t forget to take a picture and tag it #minimalistbaker on Instagram so we can see. Cheers, friends! 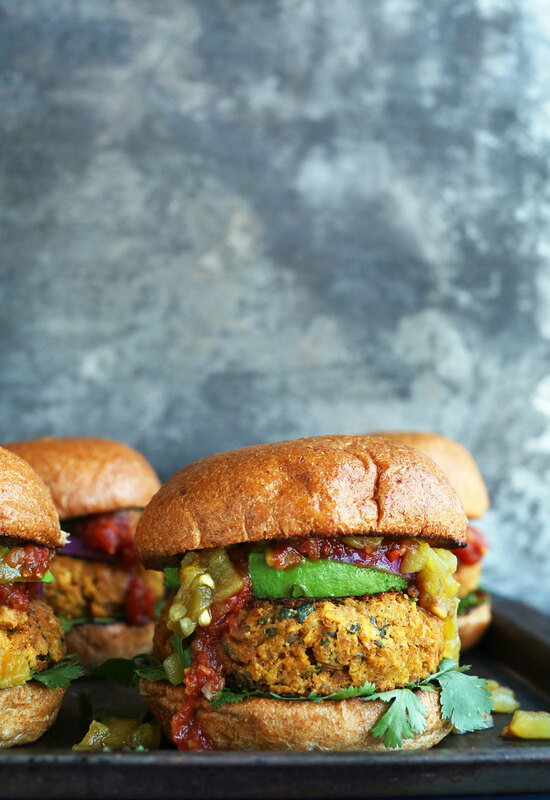 30-minute Southwest-inspired veggie burgers made with chickpeas, green chilies, and crushed tortilla chips! Tender, flavorful, quick, and so satisfying! Heat a large skillet over medium heat (and preheat oven to 375 degrees F (190 C) for a firmer burger). Line a baking sheet with parchment paper or leave bare. Once skillet is hot, add 1 Tbsp oil, shallot and garlic. Sauté, stirring frequently, until soft and translucent - about 1-2 minutes. Add garlic and shallot directly to a mixing bowl. Then add drained chickpeas and use a fork or pastry cutter to mash/mix. A little texture is OK, but you only want a few whole chickpeas remaining. Add remaining ingredients, including oil, and stir/mash to combine. You want it to form into a moldable “dough.” Add more oil or lime juice if too dry, or more crushed chips if too wet. Taste and adjust seasonings as needed. Divide into 4 even patties (see photo // amount as original recipe is written // adjust if altering batch size). To help form them, line a 1/2 cup measuring cup with plastic wrap and scoop out 1/2 cup amounts (use a 1/4 cup measuring cup for 8 smaller burgers // amount as original recipe is written // adjust if altering batch size). Press to pack, then lift out and slightly flatten with hands. Heat the same skillet you used earlier to medium heat. Once hot, add enough oil to form a thin layer on the bottom of your skillet, then add only as many burgers as will fit comfortably. Cook for 3-4 minutes on each side, flipping gently, and reducing heat if browning too quickly. You can either serve your burgers as is, or pop them on a baking sheet and bake in a 375-degree F (190 C) oven for an additional 15-20 minutes or more to dry/crisp them up. However, they’re great as is! The longer you bake them, the drier/firmer they’ll become. Let cool for 2-3 minutes before serving (they’ll firm up as they cool). To serve, lay down cilantro on bottom half of a toasted bun. Then top with burger, onion, salsa or green chilies, avocado or any other desired toppings. Leftover burgers will keep in the fridge for up to a few days, though best when fresh. See notes for freezing. * To freeze, brown burgers on either side as instructed. Then cool, separate between layers of parchment paper, and seal in a freezer-safe bag or container. Freeze for up to 2-3 weeks and reheat in a 375-degree F (190 C) oven on a bare or parchment-lined baking sheet for 20-30 minutes, or until warmed through and golden brown. *To keep these gluten-free, you could also wrap these in lettuce or enjoy atop a Mexican salad! This burger recipe has been a staple in our house for a few years, so I figured I should probably take a minute to leave a review! We LOVE this bean burger recipe. It’s so easy to throw together with simple ingredients we regularly cook with and have on hand, and it is SO SO SO delicious and unlike any other bean burger recipe we’ve tried! My almost 2 year old also loves this bean burger and has been eating it regularly since she started solids. THANK YOU Minimalist Baker for another amazing recipe! Also wanted to add that we’ve always followed the recipe as it is written, except we always double it. We’ve never baked them. We always just cook up enough burgers in a pan each night before dinner. They have a mushy texture, but we like them that way. We top with tons of avocado and some salsa verde. Soooo tasty! MAKE THESE NOW! Yay! Thanks for sharing, Bianca! I had a hard time with these. They just turn into mush. I tried crisping them up on a higher heat setting, I tried baking them to try to dry them out and no luck. The flavor is there, but they just didn’t hold well at all. I’ve made these burgers before but they just kept falling apart. So this time, I added an EGG to the mixture to help bind everything together and it worked perfectly!!! Would highly recommend doing this if you’re not a vegan. And I doubled the recipe. Thank goodness!!! So, I just finished cooking these burgers and already ate one. Yummy!!! The only changes I made, onion in place of the shallot, added a cooked sweet potato and used panko bread crumbs. I baked them at 375 for 35 minutes flipping half way through. They held together way better than I expected. Can’t wait to have another for dinner with lots of additional condiments. Adding this burger to my fave list ?. Super good, super easy and can be made ahead of time and popped into the oven to warm them up when ready to serve. Even our carnivor friends like these burgers. I usually double the recipe, use a 1/3 measuring cup to form the patties, use smaller buns and it will feed 6 with a few left over, however, beware, there may not be any leftovers these are so good! Thank you for such a great recipe! Glad you and your friends enjoyed these burgers! This was delicious! Just some chopping and prepping before mixing it all together, and boom–burgers! Only modification I made was that I roasted the chickpeas in my oven at 350 degrees for about 10 minutes to thoroughly dry them out. It’s really quite a fast recipe once you do the prep–using a good masher (mortar and pestle, even a pastry cutter) cuts the recipe down even more. Served it with lime crema, salsa, and chopped cilantro. My carnivorous family loved it! These burgers are delicious!!! My mixture was too wet so I added some more tortilla chips, but it was still quite wet. When I tried to cook them on the stove, they completely fell apart. I’ve been reading the comments and will have to dry dehydrating the chickpeas first. Love the flavors and will keep experimenting so they hold their shape! Dana, would it work if I just put the burgers in the oven instead of frying them on the stovetop? Thanks for all of your great recipes! Oh! Also wondering if omitting the oil in the mixture would lower the moisture or if it’s necessary? Let me know! Sorry to hear that they were too wet, Quinn! Definitely try the chickpea trick in the future. You could try baking them in the oven if preferred! Good luck! I made these last night for dinner and they were a hit among vegans and non-vegans alike :) The burgers made for a flavorful, FILLING, and super quick meal, so thank you!!! My mixture was a little wet from the green chili’s so when I went to fry it everything just fell apart. Any tips on what I could have done differently or what am I doing wrong??? Hi Krisann! One tip we learned from a friend recently was to dehydrate the chickpeas in a 350 degree F oven for 12-14 minutes before mashing into the mix. This should help dry them out even more next time. Good luck! This look incredible, can’t wait to try them! Wondering if it would be possible to sub fresh green chilli and add a little water to the mixture, vs a can of with liquid? Yes, I think that would work! If you give it a try, report back on how it goes! Good luck! Yay! Thanks for the kind words, Kristyna! We’re glad you enjoyed it. I’ve made these burgers a couple of times and they are awesome. This morning I wanted to prep some for dinner, but didn’t have any diced chilis. I did, however, have some leftover chipotles in adobo that needed to be used. Oh man, what a great substitute! They turned out amazing! Can’t wait for dinner. Awesome substitute, John! We’re glad you enjoyed these burgers. AMAZING!!!!!!!!! My picky picky picky 3.5 and almost 2 year old boys gobbled it down!!!! So yummy will be making these again and again! I love these burgers, They’re better and more flavorful than anything I’ve had in a restaurant or bought from the store or any other recipe I’ve tried. I seriously could eat them every other day. My vegan daughter loves them as does my dieting daughter. This is a winner all the way. I put them in a tortilla with tomato, lettuce and a little sour cream and they are incredible and so filling. I made these tonight. All i can say is AMAZING!!!!!!!!! I was sceptical at first. They are my new favorite! Husband and son loved them too! I will be making again and again and again! Thank you so much for sharing!!!!! I’m blown away by how flavorful these are. I made them tonight and just topped them with some tabasco. Will definitely make them again. I made these excluding everything spicy because my daughter doesn’t like spicy food. May be that’s why they were crumbling so I added a flax egg and it worked just fine to keep them together. The flavor is just perfect! Thank you for this recipe! Awesome. The salsa works great. Added goat cheese. If they fall apart, add egg yolk or try to work longer on the burger “dough”. I made them…i think they are delicious however they broke when i tried to fry them….my mother in law told me to add egg but i said the recipe didn’t say much about it adding egg if they break…do you have a fix? My boyfriend and my best friend and I just made these for dinner and they were AMAZING!!! We doubled the recipe to have more later on this week and I can’t wait. Whenever I make things with chickpeas it usually comes out bland or too dry. This was probably the best thing I’ve ever made with chickpeas, and it was neither bland nor dry. Only thing I’d probably do differently next time is add more salt. Thank you!!! These are fantastic! Worked perfectly as mini sliders 1/4 cup-sized patties. Didn’t have grape seed oil but EVOO seemed to work fine. Fried mine in the air fryer for 15 minutes at 380. I LOVED the beet/quinoa burgers too, but these were much easier and quicker to make. Thanks so much for the amazing recipes! LOVED THESE! I don’t even care that they didn’t stick together; they were so good, though next time, I will add a flax egg to see if they’ll stay in patty form. Don’t be afraid of the level of spice; they are pretty mild unless you are super sensitive. You could add jalapenos or another type of pepper if you want some more heat and I’m definitely going to add chili garlic sauce next time. We topped ours with corn salsa (adding corn to the patties would be great, too), avocado, lettuce and red onions. These deserve a really good hamburger bun, either homemade or something a little nicer than the ones you can find in the bread aisle. 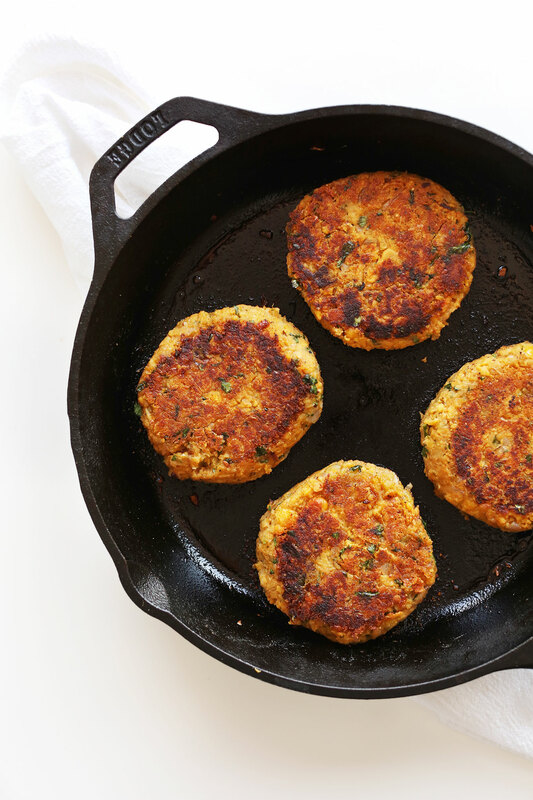 These burgers are a great alternative to store bought dry, bland veggie burgers. These were incredible, I made them almost as directed (but with red onion in place of shallot and half panko since I didn’t have enough tortilla chip crumbs). Topped them with red onion, homemade chipotle mayo, roasted jalapenos and some spicy hatch green chile salsa from Trader Joes, and served them to 3 non-vegetarians and 1 vegan. Everyone loved them and one of the meat-eaters said that I had converted him to the veggie burger wagon. 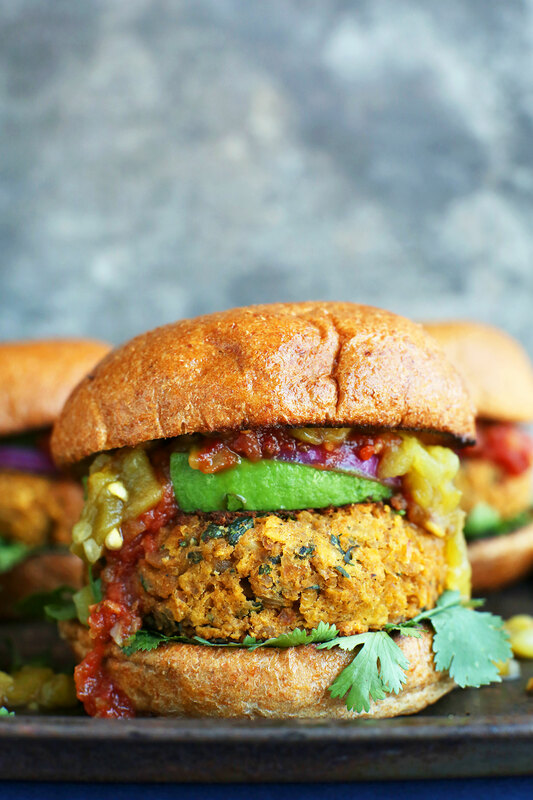 They’re on the short list for my favorite veggie burgers for sure! These burgers look and sound amazing and I sooo want to make them! However, I’m in the U.K. and I don’t think we have those cans of green chilies.. what could I substitute?! The first time I made these I tried frying them and they started falling apart, but, I broke the burgers apart and made it like sloppy Joes, my husband (who is a meat lover) and I both loved It! This time I put everything in a food processor and will put them in the oven. The flavor is outstanding! Thank you! Hi! I don’t have breadcrumbs or tortilla chips on hand, so I was wondering if I could somehow substitute quinoa into the burger? If so, would I need to use cooked or dry quinoa? Hi Dani! I wouldn’t recommend quinoa as it will likely make the burgers too moist. If you do try it though, report back on how it goes! I have to be vegan, gluten-free, corn-free, and potato-free. What can I use instead of bread crumbs or Tortilla chips? About to make these but find myself confused. The directions say to saute onion in a pan, but onions not listed the ingredient list. Is there a measurement that is best here? A certain kind onion? I cannot wait try these as they look absolutely delish!! I love these burgers. I started making these about 6 months ago and my husband asks for them once a week. I double the recipe because they go so quickly. I add a quarter of a red pepper and a seeded jalpeno to mine. They are my absolute favorite. Btw, I love your blog. Thank you for all the vegetarian recipes! I am planning to make these burgers and wanted to print the recipe. However, the print recipe feature doesn’t give the recipe, just the picture and some dots. I can print it a different way, but wanted to let you know that this feature doesn’t function properly for this recipe. Hmm, I tested it out and it worked for me! Maybe try clearing your browser cache or try another browser like Google Chrome?! Sorry for the trouble! I did try clearing the cache. Still doesn’t work. The other recipes print fine using the print friendly feature. This is the only one that does not. Oh well. I made these on Sunday but could not get the patties to stay intact. I decided to make this “sloppy joe” style instead. I toasted the buns and added homemade vegan queso and guacamole. AMAZING!!!! We were all blown away by how delicious this was!! Glad you still enjoyed it Sarah! If you try it again, maybe add flax egg or a little water to help bind the mixture together! Also, check out the sundried tomato chickpea burger if you’re looking for something that really holds together well! These are incredible!! I used the suggested crushed tortilla chips and I really think that added to the flavor! I also made a vegan mayo with lime juice, mashed avacado, vegan mayo, a tiny bit of Dijon and a tiny bit of reduced sugar ketchup with salt and pepper to taste!! It was amazing! You are unbelievably talented! Thanks for sharing that talent with us!! Keep it up! We made these for our Memorial Day cookout and they were incredible!! I’m into making everything spicy these days so I added one diced and seeded jalapeno for an extra bit of kick…oof. Delish. Thank you, you’re a food wizard! This recipe is hands down the best thing I’ve ever made! And I am a chef! I made a lot of adjustments and it still came out AMAZING! I used a brown rice bread crumb instead of the chips and then I added curry and used a mild green pepper swapped out cilantro for parsley. The texture of this bad boy was amazing! This burger holds up so well! it was just mind blowing! Can’t wait to make these again! 5 5 stars all the way! These were great! I made them once as-is, and then a second time subbing pinto beans for chickpeas and panko bread crumbs for the tortilla chips. I used New Mexican Hatch green chile because I always have some on hand. I’m from New Mexico and pinto beans are far more common than garbanzo beans there, so I preferred that as it tasted more familiar to me, but my husband loves chickpeas to death so he liked the original. Both were awesome though! Definitely making these again soon. I also coated the outside with garbanzo flour, so there’d be a crust. Just made these for my family they are amazing and so filling except with vegan sour cream if you do a bun. And I still have plenty of leftovers for lunches!!!! I made these this past weekend during my weekly meal prep and we had them for dinner last night. To reheat, I followed the directions for 15 min at 375 and they reheated perfectly, without drying out. I used quick oats instead of tortilla chips or bread crumbs and a diced jalapeno instead of canned chilies. These were so easy to make and kept their form. Served wrapped on a collard green and topped with avocado, cilantro and roasted tomato. Definitely will make again! I am in the UK. 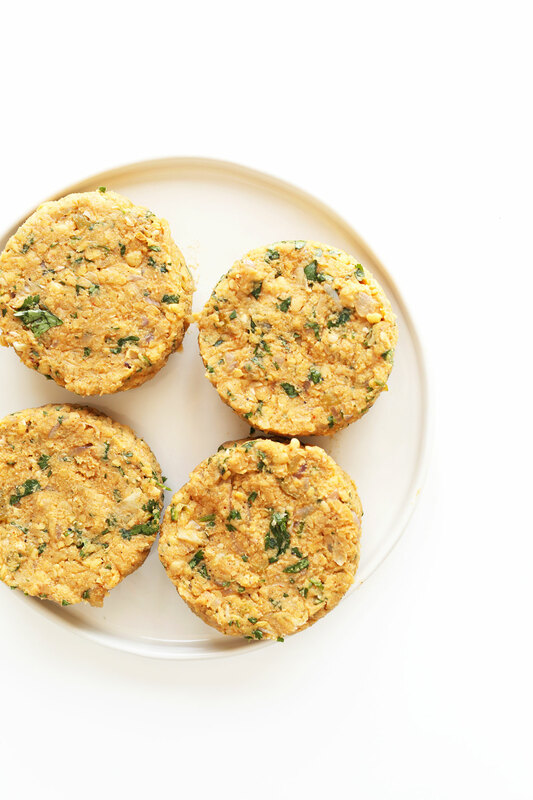 I have already tried veggie burgers with oats which are really tasty, but heavy on ingredients. I am going to try these as not only are they light on ingredients, but heavy on taste which is important. Will post my review of hiw they turn out over the weekend. Thanks for this good recipe. We made these last night and they were wonderful. They were much firmer tonight after a second trip under the broiler. I think we made them a little too big. The flavor is great and they didn’t need much added to them. We used tomatoes and your salad dressing on wheat ciabatta rolls. Very filling and good! The flavor of these burgers is amazing! I however had too much liquid I think and they fell apart. They were too good to toss, so I ate the crumbled pieces on top of some potatoes. Can’t wait to try them again. Love this blog! This was delicious but I had a difficult time creating firm patties. Do you mind providing more details on your technique when combining the ingredients? I added more chips and it still didn’t help. Tiffany– my patties were too wet when I started working with them as well. I added more crushed chips and then used Dana’s method for packing the patties in a 1/2 cup measuring cup. When I pulled them out gently with plastic wrap, I had well packed little burgers. I sautéed them 4-5 minutes on each side in the pan and then threw them in a 400 degree oven for another ten minutes or so. They came out perfectly! Hmm, sounds like adding some more dry ingredients would’ve helped? More chips, perhaps? And then, just be very gentle when cooking. I’ve made these twice, they’re so easy and delicious! This is also the third recipe I’ve made from your website, I’m always pleased with the simplicity and taste! Ah, thanks Amanda! So glad you liked these! Such an easy and absolutely delicious go to meal! Love your site!! These are phenomenal! I added a healthy dose of cayenne for spice and topped the finished burgers with avocado and jicama. Thanks for the awesome recipe! Heya, I’m in the UK, they don’t seem to sell canned green chilies here anywhere… only jalapenos. Would they work or should I just chop up some fresh green chilies? I’ve been making these all summer! I love topping them with salsa because salsa is one of my favourite things. Thanks for the recipe! Wonderful! Thanks for sharing, Katrina! Whoop! Thanks for sharing, Hallie! This was my first time trying chickpeas (believe it or not!) and they will definitely be a staple in my pantry from now on. These burgers were delicious and so easy—no food processor to clean! I made them sans cilantro because mine wasn’t looking so hot, but they were still plenty flavorful. So wonderful! thanks for sharing, AJ! These were easy to make and the favors were amazing! The meat eaters were raving and begging for more. I added more chips since my mixture seemed a little on the wet side. They still had a fair amount of excess moisture even after baking and that made them fragile. They fell apart a fair amount when being eaten. I will definitely experiment with this recipe to get the texture just right in the future. Four empty plates and four full bellies. Another awesome recipe! You guys never let me down. Well done! Thanks Sarah! One tip I learned from a friend recently was to dehydrate the chickpeas in a 350 degree F oven for 12-14 minutes before mashing into the mix. This should help dry them out even more next time. Good luck! Ooooh can’t wait to try this!!!! These were absolutely delicious! My meat-loving boyfriend was skeptical at first, but quickly devoured his bun-less patty and asked for seconds. They were so delicious on their own, but were extra tasty with avocado and salsa on top. Thank you for sharing – this will definitely be a new lunch staple in our house! Hi! Is there a substitute for the grape seed/avocado oil? I sauteed the onions and garlic in a little veggie broth. Baked the burgers. No added fat. Used cornmeal instead of corn chips. They were fabulous and much lower in fat. This is a fantastic recipe, and doesn’t need the fat to taste great. I made these and they fell apart when I tried to fry them. I even added more oil to the mixture. Where did I go wrong? I did, I mashed them with a fork until they were all mashed but not pureed. I added about a teaspoon of cornstarch to the mix and the difference was night and day. This recipe is a smash hit, we love it! Currently chowing down on my second helping! This is going to be a new go-to recipe. Delicious! How did you make the the patties stick together? My burgers kept falling a part. I couldn’t keep them in patty form, so when I sauteed them, they wouldn’t stick. I was having the same issue, then the second time around I added about a teaspoon of cornstarch to the mix and voila! They packed into firm patties, easy to flip and minimal fallout when eating on a bun. Yes, my burgers taste amazing but fell apart once in the pan. I will try the cornstarch next time. Thank For Good information of Great for me. These were great! My husband loved them too and my 1 year old ate over half a patty by herself. Thanks for the great recipe! These look so delicious! I must try to make them! Perfect summer dish too! We made these two days ago (Saturday) and we really loved them. They held together perfectly, were super easy to make and thanks to the green chilies tasted out of this world. We served ours on poppy seed buns topped with romaine, tomato, avocado, dijon and some Minimalist Baker Whiskey BBQ Ketchup. We cannot wait to eat them again! About to make these burgers which look AMAZING as all your recipes do. One question for you: How much onion am I sautéing? Is it for a topping or does it go in the burger itself (instruction #2)? Nvmd I believe you are meaning the shallot – sauté with the garlic and add to the chickpeas. Sorry a dunce in the kitchen moment. Made these tonight and they were absolutely fantastic! I will definitely make these again and plan to try your other veggie burger recipes (these were my first attempt at homemade veggie burgers!). Thanks for an amazing dinner. These are delicious! I made them a couple of days ago, along with a quick salsa, and homemade bread rolls. The burgers have so much flavor, a success – you guys rock! So great! Thanks for sharing, Franck!! Taker right here! These look scrumptious!! I’m not sure if it’s the former vegetarian in me, but I love all the vegetarian burgers too! ♡ Love the Mexican flavors you jam packed in these…and chips! Whaa!!?? Genius! Can’t wait to give them a try! Thanks for sharing! Thanks! Let me know how it goes, Cheyanne!! These look delicious! I love how thick they are too. Oh hello there gorgeous burger indeed! Simple + packed with flavors? Count me in. Also – as someone who knows first hand HOW hard it is to shoot burgers, I’m super in awe of how gorgeous you made these burgers look! It was lovely meeting you this weekend (despite my weirdo fangirl awkwardness) – you two should come back down the the Bay again (you know, so Lucas and John can hang out…haha). But seriously – if you do, we’ve got a spare room with your name on it! Really enjoyed this recipe! The flavored were perfect. Next time I will make a spicy aioli to go with it. So great! Thanks for sharing, Devi! 2) Thank you for another Mexican themed post. These burgers look like heaven; sweet, spicy heaven. I love the topping choices too, not going to change them one bit on my first go round. Love that they are freezer friendly, because we all need some burgers ready to go when the day is long and the stomach is yearning for something healthy, hearty, and of course…tasty as hell. Thanks for sharing + for the kind words, Jennifer! Right? So sick of seeing “I made this but added bacon and chicken and used butter and cream! So good!” It’s disrespectful in my opinion. Dana, your recipes are the only ones which 100% make me reconsider being a full fledged meat eater. These look delicious and I’d faceplant this. LOVE LOVE LOVE this recipe! Can’t wait to try it! This looks delicious! I’m a hardened meat eater but would love to try these! Oh my god these look so good! When I was veggie I basically lived off burgers like these, but I always found that there’s a tendency for veggie burgers to be really dry and sensitive about how they’re cooked. But these look to die for! Definitely trying this one! Oh yes! 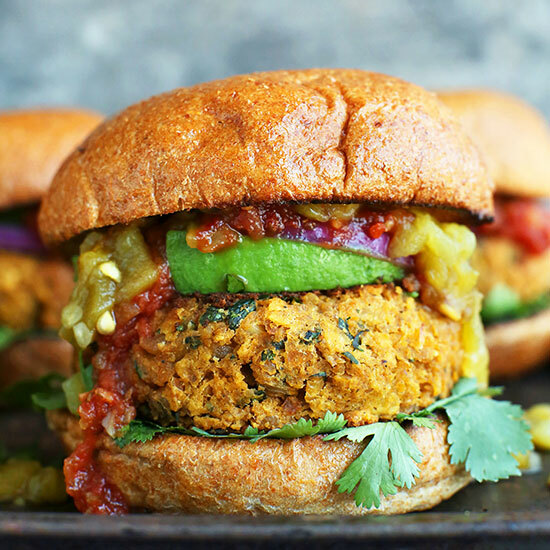 I love me some veggie burgers–never thought of them Mexican style! Ooh, YUM looks Delish! As I looked over the recap recipes for May I realized I had made almost everything! In fact I have given away a lot of my cookbooks. Your recipes are not only really good but simple to make and with ingredients I usually have on hand. Do you take requests? So amazing!! You are so kind. I always take requests. Fire away! These little cakes look so delicious! Love the flavour! OMG this looks so good! I’m sure those green chilis add such a burst of flavor—- pinned! I had just finished cooling a big batch of chickpeas when I got the e-mail with this recipe. Everything else was in my cupboard and there were plenty of parts for my daughter to help with (smashing chickpeas always fun). These were so easy to put together and so tasty! Thank you! OMG, Those patties look amazing. I absolutely love that texture. Winning mega-big time with these you two! Tortilla chips INSIDE the burger patty?! Game changer. Brilliant. Hats off. Bravo! Ha! I thought you’d like that fancy touch ;D Much love friend! Oh boy-that looks SO good! My veggie burger craving just got like…100000x’s bigger!! I will HAVE to try these! Ha! That’s the effect I was hoping for. Hope you give these a try, Annaliese! OMGoodness! This looks delicious as I have been craving a really good veggie burger and they are usually hard to find. I plan to top it with some grilled radicchio as I like to add in a superfood whenever possible, and I think it would taste great with the burger and some avocado, but otherwise I would leave the recipe exactly as-is. Thank you so much for sharing this! Those toppings sound killer!! Hope you love it, Julia! Veggies burgers are amazing but sometimes being a veggie, you find the same burger recipe over and over again. These are different though with the Mexican vibe, I love coriander and green chillies; these seriously look like the perfect burger! I am SO EXCITED about these and I can’t wait to make them! One question – should I dump in the whole can of green chiles, water and all, or should I drain it? I used the whole can with liquid, but you can drain them slightly if you wish! Hi, if I was you I would drain it. I think the mixture will be too soggy. OMG I NEED THIS IN MY MOUTH! The flavour looks so bomb! crushed tortilla chips — that’s creative! 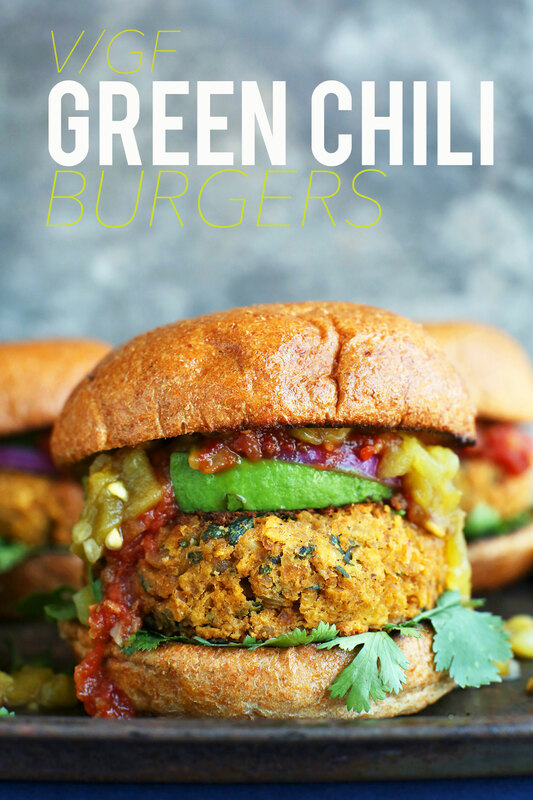 These green chili burgers look amazing! I need to give these a try soon! 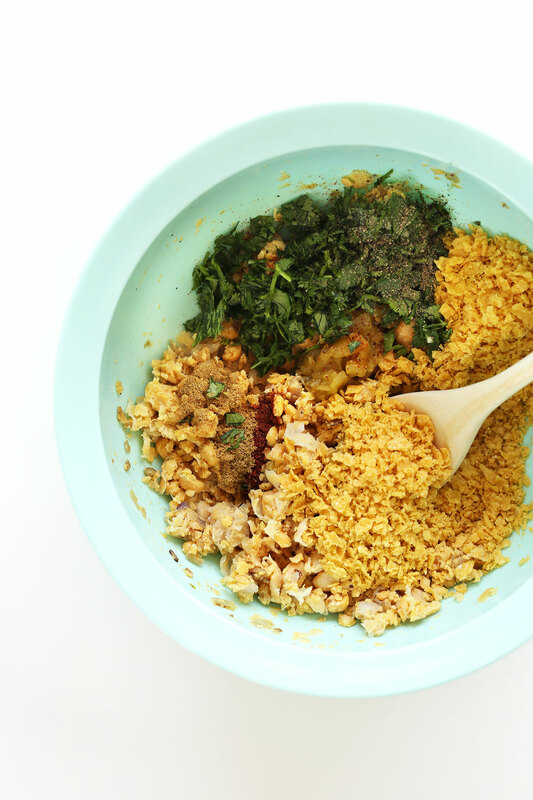 The chickpeas, cilantro, crushed tortilla chips and green chilies sounds like and awesome combination! These sound so amazing and I love that they are GF! Also side note: I am obsessed with shallots. In and on EVERYTHING! Crispy shallots with sautéed kale, cooked in my morning omelette, pureed in a vinaigrette. I could go on and on. So excited to try this! Thanks Alexa! Hope you love it!